It's been two weeks now, since I attended the PCU Ball at the Dolder Grand Hotel in Zurich. About 5 weeks in advance, I tried to find a dress. And as I had some high expectations for the perfect dress, I ended up quite disappointed. I couldn't find a dress in all the stores I checked out, even the internet could help to find something online. One Day, I enjoyed a beautfiul afternoon in Zurich, I walked around with a friend, on our way to the ballet shop, we stopped at a window and gazed insight. There hung the most beautiful white dresses I've ever seen around town. I just told my friend, whenever I should get married, this is the way my dress should look like. So we just had to go in there. They had not only white wedding dresses, but a lot of the most beautiful evening dresses. And for an affordable price. I mean, of course, Dior and Chanel do have some wonderful dresses, but for many of us, they will stay a dream. 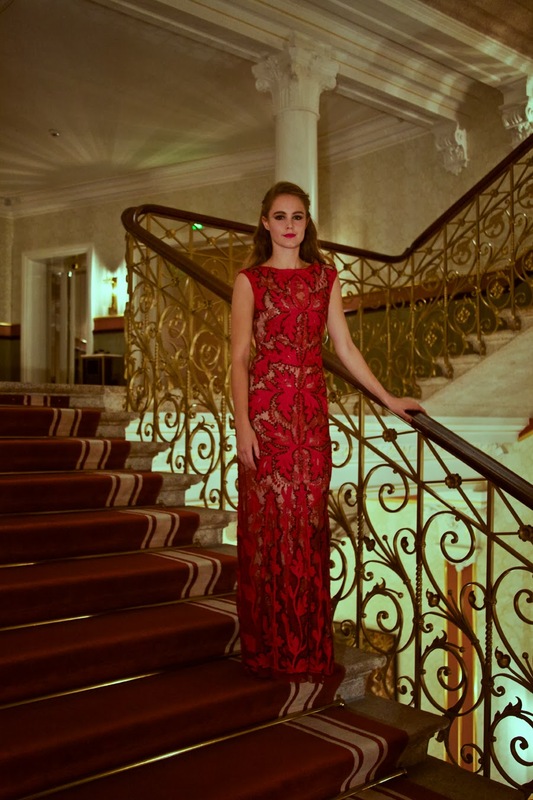 So I felt in love immediately with a red lace evening dress, with black embroidery on it. And thanks to Phase Eight, I found my perfect dress for the ballnight. I compared it with black high heels from Zara, and a little gold necklace from vanrycke. I really kept it simple with accessories. I was so happy to wear it, and we spent a wonderful evening at the Dolder Grand Hotel. After a very pleasant ride with Uber, we arrived at the beautiful Dolder Grand, which was already decorated for Christmas. So lovely. So if you need a dress for Christmas Eve oder for New Years Eve, I'm sure you're gonna find one at Phase Eight. I'm in Love with this Brand. And I'm sure it hasn't been the last time I found a dress in this store. So for all the girls in Zurich, the store is located here, at the Limmatquai in the centre of Zurich. Or check out the store online here. Du siehst so wunderschön aus! <3 Ein ganz tolles Kleid, das du da trägst, ich finde das Rot steht dir perfekt! !